On your mark, get set…READ! This year’s theme for the Windham Library Summer Reading Program attracted many Olympian readers! Following the 2016 Rio Olympics, children got involved in a series of activities aimed at producing avid readers. Children in grades K-4 received reading packets upon registration and tracked the books they read over the 5-week program. Each received a prize after every 10 books read and logged. 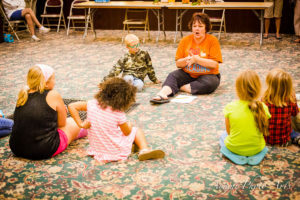 While the main emphasis of the program was to keep students of all ages reading during the summer months, it also gave them hands on learning experiences. “The Wonderful World of Insects” and “International Cooking” topped the list of fun and engaging. “We learned about so many different insects” said one participant. Another raved about International Cooking and “liked learning new things outside of school.” All hopes are high that students share the same enthusiasm when returning to school in a few short weeks. The Library Reading program was sponsored by a grant from the Windham Foundation. The Windham Foundation is a 501©3 not-for profit organization, governed by a volunteer, Board of Directors. Visit www.windhamfoundation.com or call 518-734-9636 for information or to donate to this and other programs supported by the Windham Foundation.